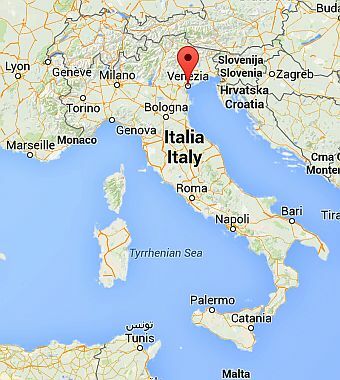 The climate of Venice is moderately continental, similar to that of the Po Valley, with cold and moist winters and hot and muggy summers, but it's slightly tempered by the Adriatic Sea. Precipitation totals 750 millimeters (29.5 inches) per year and is well distributed over the seasons. There are two relative maxima in spring and autumn, when Atlantic depressions are more frequent; in these cases, the south-east wind ("scirocco") blows, which collects moisture from the Adriatic Sea. Here is the average precipitation. 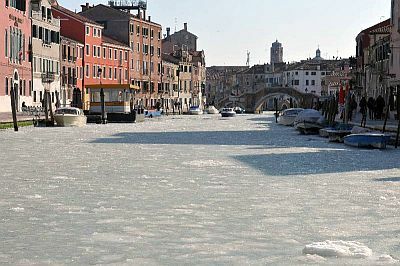 In addition to the sirocco, Venice is subject to the bora, a cold wind blowing from the plains of Eastern Europe, especially in winter and spring. The bora sweeps the Venetian plain and the lagoon of Venice, although with a lower force than in Slovenia and in Trieste, where it is channeled through the mountains. 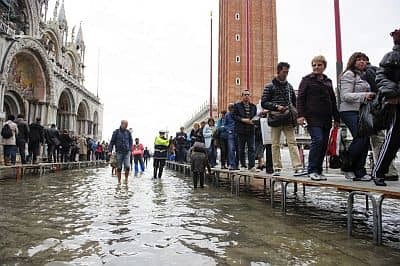 The phenomenon of the so-called acqua alta (high water) occurs in bad weather conditions, and it's due to a combination of wind (the sirocco, which obstructs the flow of rivers into the sea) and tide (which raises sea level). Winter, from December to February, is cold, damp and gray. The coldest months are, as is normal in the Po-Venetian plain, January and December. At night, light frosts occur often enough. Fog is quite frequent, and also in March. When the bora blows, because of the wind chill, the air feels colder than it actually is. During intense cold waves, the temperature can drop below -5 °C (23 °F). Here are some temperatures recorded in recent decades: January 1985: -12 °C (10 °F), December 2009: -11 °C (12 °F), February 2012: -9 °C (16 °F). Sometimes frost can also occur in early March, or in late November. During the coldest winters the lagoon can freeze, as happened in 1929, 1956, 1963, 1985 and in February 2012. Snow is seen almost every year, but it's generally not abundant, in fact the bora is originally a dry wind, and generally brings at most light snowfalls, while when it snows in the western Po Valley (see Milan), here the sirocco raises the temperature and brings rainfall. Spring, from March to May, is a quite rainy and unstable season. There is a moderate amount of sunny days, but there can still be cold and foggy days (especially in March) as well as periods of bad weather and wind. Typically, by the second half of April, the temperature becomes pleasant in a more stable manner, but the bora can sometimes still blow, lowering the temperature for a few days, also in May. Summer, from June to August, is usually sunny, and it's often also hot and muggy, but with the breeze that tempers a little the heat. Even in the hottest days, it is rare for the temperature to rise above 35 °C (95 °F). In the afternoon, thunderstorms can break out, while sometimes the bora can blow, bringing a bit of cool weather. Autumn, from September to November, is initially pleasant (in September and sometimes in early October), with many sunny days, alternating with some rainy periods, and then gradually becomes more cold, cloudy and rainy. The amount of sunshine in Venice is good in late spring and summer, from May to August, when there are many sunny days, and it is still acceptable in September. In the rest of the year, it is not high because there are many cloudy days, and even a bit of fog in the coldest months. The sea, in the Venetian lagoon, but also along the coast of the Northern Adriatic Sea (see Jesolo), is warm enough for swimming in July and August, when the water temperature reaches 25/26 °C (77/79 °F), while it is still a bit cool in June. 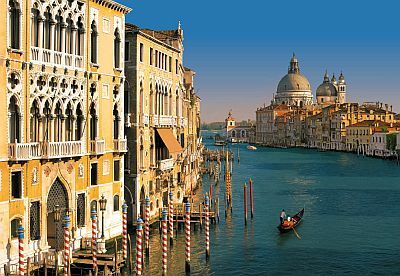 The best periods to visit Venice are spring and autumn, and in particular from mid-April to mid-June and the month of September. However, in both periods some rainy days are possible. July and August, and more rarely the second half of June, can be hot and sultry; in August, there are many tourists (and many mosquitoes), and the lagoon doesn't always smell good.